In June 2016. the Food and Drug Administration (FDA) of USA approved a new oral live cholera vaccine for use in adults. The vaccine can prevent cholera caused by the bacteria of serogroup O1, which constitutes a majority of the outbreak cases (the other serogroup O139 is largely transmitted in Southeast Asia). The Centers for Disease Control and Prevention (CDC) of USA issued an update on the recommendations of the use of cholera vaccine on 12 May 2017. Vaccination is recommended for adult travellers of age 18-64 planning a visit to an area of active cholera transmission. As of May, 2017, such practice has not been followed in Hong Kong and other countries. 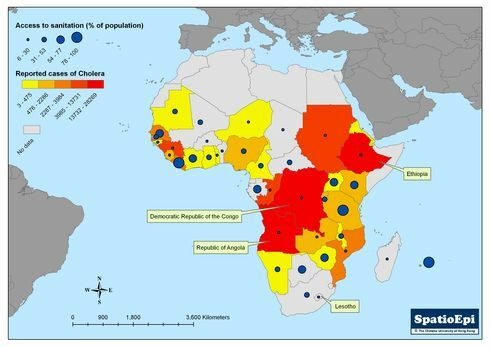 The map shows the distribution of cholera endemic areas (data from an article published in PLoS Neglected Tropical Diseases) in 2008-2012 and the number of cholera cases reported to World Health Organization (WHO) in 2015. Most of the endemic countries were located in central Africa. The country with highest number of cases reported was Afghanistan (58 064), followed by Haiti (36 045) and Democratic Republic of the Congo (19 182). It should be noted the number of reported cases does not necessarily reflect the actual severity of cholera outbreaks. Some of the affected countries may not have reported or under-reported for fear of negative impact on the economy, lack of a well-developed surveillance system, unclear diagnostic criteria or inadequate laboratory capacities. Access to clean water remains the best means of preventing cholera, while the public health application of vaccines would require further research to establish its role. 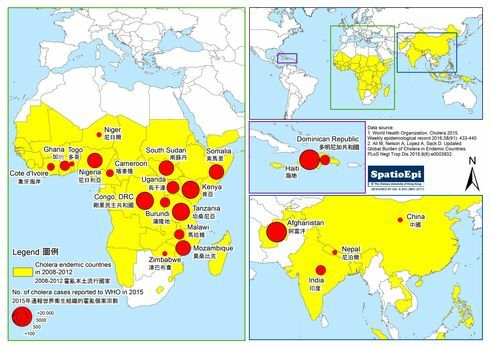 Data for the map were retrieved from WHO and PLoS Neglected Tropical Diseases. Ali M, Nelson A, Lopez A, Sack D. Updated Global Burden of Cholera in Endemic Countries. PLoS Negl Trop Dis 2015;9(6):e0003832.